September presents “Recognize you when she sees you, Give you the things she has for you,” an exhibition of artists’ books from unique books to limited editions. Artists included are: Sonia Almeida, Polly Apfelbaum, Annie Bielski, Nancy Bowen, Sarah Braman, Dawn Breeze, Ria Brodell, A.K. Burns, Cynthia Daignault and Curran Hatleberg, Patricia Fernández, Lilah Friedland, Kate Gilmore, Joanne Greenbaum, Tamar Halpern, Bibbe Hansen, Jessica Jackson Hutchins, Melinda Keifer, Rosy Keyser, Laleh Khorramian, Rebecca Loyche, Xander Marro, Kate Newby, Incident Report, Emma Ressel, Lil Deb’s Oasis, Kay Rosen, Rachelle Reichert, Brie Ruais, Carrie Schneider, Nancy Shaver, Barb Smith, Laurel Sparks, Odessa Straub, Brittany Tucker, Marianne Vitale, Letha Wilson, Carmen Winant, Sun You, and Suzanna Zak. An intimate experience of an artwork is a privilege. To touch a work of art is to come to terms with its object-hood, to understand its materiality and impermanence. It is an investigation, a desire to comprehend a work’s own language of shape and material. From unlimited zines printed on Xerox paper, to unique works with folded inserts, the artist book cannot be verbally or visually summarized; it must be opened, pages turned, textures felt, orientation moved. 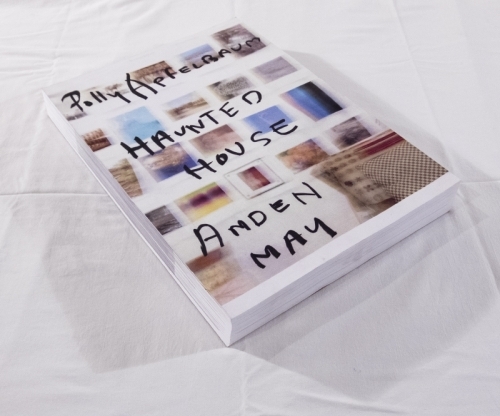 From closely guarded sketchbooks to finely bound autobiographical reckonings, the artist book demands private interaction and contemplation. Holding something (in the case of both objects and people), even for a moment, is to cherish it. Acknowledging the complicity of touch from maker to reader, the artist who undertakes a work in book form does so in anticipation of being held. She understands material comprehension. An artist highlights old tomes in bright hues with patterns set over text, both illuminating and hindering your attempts to understand the information of the original. She collects images of hundreds of births and jams them together, putting on display the raw bodily carnage of childbirth while couching it in a universality that numbs the shock and induces awe. She cuts, inserts, layers, and folds pages with landscapes images, creating textured collages with absences for you to maneuver. She wraps covers with fur to ask you to treat them tenderly, to recognize their soft and wild fragility. Please touch the artwork.